With canyons, gardens, waterfalls and more, Zion Canyon National Park is amazing on its own, but the entire surrounding area adds depth to amaze the visitor, including historical, cultural and natural attractions. Zion Canyon National Park should be in the hall of fame of national parks, if such a thing existed. With slot canyons, red sandstone walls, hanging gardens, endemic species, waterfalls and desert streams, Zion is beautiful, inspiring, challenging, and more. It's the type of place the national parks system was created to protect. The center of the park and its main attraction, Zion Canyon is visible from a number of different perspectives, including scenic drives, day hikes, and long multi-day excursions along the rims. The red sandstone cliffs harbor an astounding selection of cliffs, canyons, waterfalls and more. One of the most famous locations in the entire park, this monolith towers into the center of the canyon, seemingly stretching into the sky. The tiny plateau is reachable by a day hike, strenuous but worth every drop of sweat. There isn't much that could prepare someone for the sight of sandstone cliffs nearly closing in on themselves, hundreds of feet above river on the narrow canyon floor. It's simply one of those wonders that must be experienced to understand. Emerald Pools has waterfalls, hanging gardens filled with flowers, dew-dripping ferns, pools to beat the heat and pictures to take home. This is one of the must-see highlights of the entire canyon. It may be a difficult place to get to, but The Subway is an incredible route for canyoneering adventurers, following the river through the course it cut over thousands of years. Not too difficult to conquer, it's a perfect way to get newcomers hooked into this growing sport. This is a textbook example of a hanging garden, complete with drip-lines, ferns, flowers, waterfalls and overhanging pool to keep everything cool. The intricacy and complexity of the micro-climate will astound anyone who is the least bit interested in plants. Since the very beginning, hiking has been a popular activity in Zion. Trails have been cut, maintained, repaired, and expanded until the massive system of trails was created, which is today used by thousands of visitors. The options are diverse, offering something for everyone. This sport could easily have been invented and developed specifically for this area. Descend steep canyon walls, rappel, downclimb and traverse uncertain waters in some of the many canyoneering areas of the park. Any climber who looks at the slot canyons, the giant monoliths at Angel's Landing or The Sentinel feels that itch in the fingers, reaching for a cam to put in those perfect cracks. 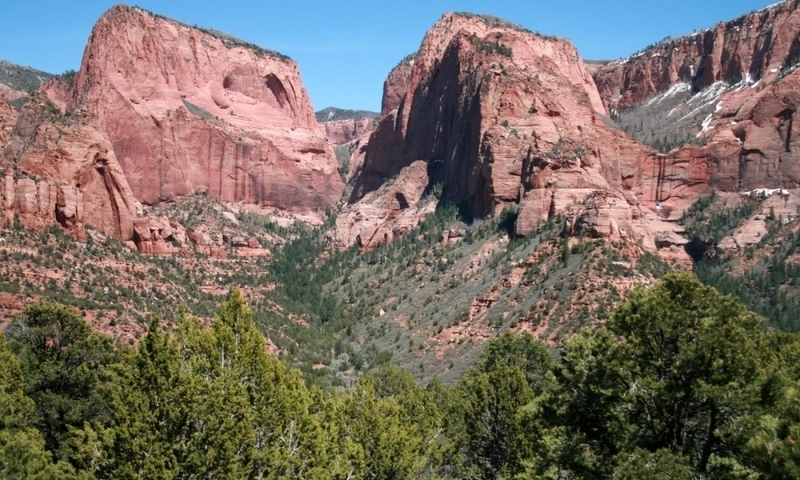 Backpackers who enjoy getting off the trail will find themselves at home in Zion. As always, it takes a good deal of effort and self-motivation to get out into the wild, but those who do will appreciate it even more. This canyon has always lured in adventuring visitors, even retaining "interesting" anchors from the past, when there were no standards. The canyoneering is spectacular, including tight canyon walls, a seasonal lake, and a 120 ft. rappel. Convenient, tight, technical - a canyoneering dream! There are multiple rappels down this moderately technical trail, which is one of the more popular trails in the park, due to its ease-of-access and duration. If you're even considering these technical, multi-day canyons, then you must be a adventure addict. The 300-foot rappels, hours swimming in cold potholes, and ratings of 4B R V all mean serious business. Ever wonder what those canyoneers are raving about? Echo Canyon is an opportunity to get into the slot canyons, wade through some rivers without all the technical skills or gear. Orderville Canyon is a great way to reach the Zion Narrows without the crowds doing the full hike, all the while exploring an even-narrower slot canyon, at times only 10 feet wide. Take a couple hours to explore Keyhole Canyon, a short, moderately technical canyoneering route. Rappels are short, the downclimbing minimal, but the swimming is cold and intense, so travel light and come prepared. Take a look a footprints over a foot long from real dinosaurs. The long-extinct creatures walked in the area, leaving impressing proof of their habits and incredible size. History for the Mormons in Utah began in Mount Carmel, where they founded their first settlement and church. Take a look at the beginnings of one of Utah's most influential groups. Zion Canyon has a long history with human, starting over 12,000 years ago when the first people used it as part of their hunting grounds. This museum details and explains the discovered artifacts and humans' influence in the canyon. For those unfamiliar with this looming figure in pioneering America, Brigham Young lead the Mormons from the east to start their permanent settlement in Utah. His winter home has been converted into a museum, paying homage to his life. Get a taste of local history at this museum, showcasing the development of the town, including antiques and artifacts belonging to the original settlers of the area. Take a look at artists, both local and national, who have made a name in the area. Portraits, landscapes, western scenes and more are on display at this museum, which helps support the local art scene. Located just north of St. George, this recreation area offers hiking and biking trails in a spiderweb network that has views of the surrounding cliffs, volcanos, mountains and desert scenes. While certainly not the most famous of sites, this National Monument is an oasis in the desert that provided water to humans for thousands of years, including the first Utah Mormons. The exhibits explain the bitter struggle over the desert's most precious commodity. A photographer's dream, this state park has sand dunes of pink, red, and beige stretching over three thousand acres. Hikers, off-roaders and massive sandcastles all share this special land. Black volcanic rock contrasts the red sandstone, creating beautiful and unique scenery for the hikers and bikers who explore this area just north of St. George. Locals know Quail Creek for the hiking, boating, camping and picnic opportunities on the lake, giving some respite from the hot summer, or an outlet for winter activity. Off-roading, mountain biking, fishing and more are all available in this small, but popular, state park located to the east of St. George. Few drives can boast the sites of this 6.5 mile drive up the canyon floor of Zion Canyon. The route passes some of Zion's most famous sites, including Angel's Landing, The Sentinel, and the Temple of Sinawava. Descending to the floor of Zion Canyon, passing from the canyon rim, through an impressive 1.1-mile tunnel, then coming out to continue past the abstract geological formations in the sandstone cliffs. Often forgotten in the northwest corner of the park, Kolob Canyon is a completely separate canyon, uniquely beautiful. This scenic drive is a great way to get acquainted with the area. Running right between the Kolob and Zion Canyon, this road access the highlands of Zion, including Lava Point, where the entire park seems to stretch out in front of the overlook. If you're pressed for time, make time to pass through this convenient scenic drive up Snow Canyon. It will astound passengers and drivers alike with red and black rocks in swirling formations. While passing through St. George, make sure to take advantage of the extensive trail system, both inside and around the city. There are trails for hikers, bikers and others outdoor enthusiasts. The Western Sky Aviation Warbirds Museum is dedicated to the preservation and display of aircraft.